As a naval architect, engineer, yacht designer, 3D modeler or software developer, this is a unique event you cannot miss: A collaboration between McNeel, Facultat de Nàutica UPC, and Colegio Oficial de Ingenieros Navales y Oceánicos. 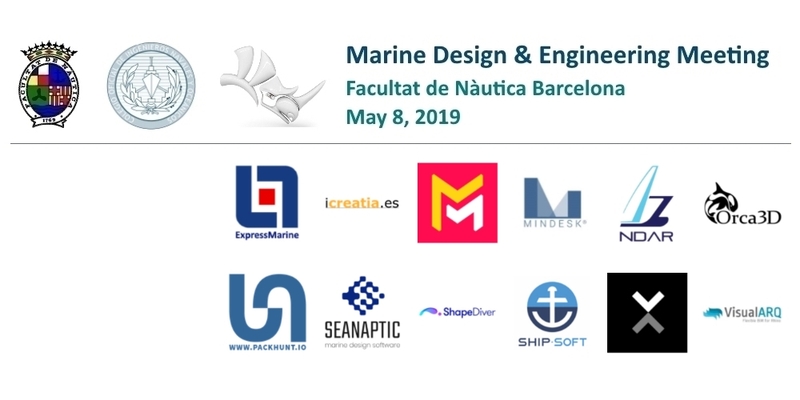 In Barcelona, at the historic Facultat de Náutica at Pla de Palau, international industry experts will present their latest projects and their state-of-the-art CAD/CAM/CAE/VR toolsets. Keynote speakers include Steve Baer (Robert McNeel & Associates), Menno Deij - van Rijswijk (Maritime Research Institute Netherlands - MARIN), Iuliu Prepelita (Seanaptic Ltd.), Liam Woolley (Pivot / Goldfish), Gerard Petersen (RhinoCentre NL), Stéphane DARDEL (NDAR / Orca3D / ExpressMarine), Matthieu Arnold (Ship-ST), Ramón Cárceles (VisualARQ by Asuni), Dariusz Sawicki (Prometso), Javi Ferrín and Adriá Fradera (De Antonio Yachts). Get hands-on with live software demonstrations from solution providers in hull design and fairing, parametric engineering, CFD, piping, virtual and augmented reality, visualization, product configurators, and much more. Confirmed exhibitors are icreatia, Mindesk, NDAR, Seanaptic Ltd UK, ShapeDiver, Ship-ST, VARJO, Orca3D, ExpressMarine, Packhunt.io, Maverick Render and VisualARQ. Meet the McNeel staff and learn more about the new functionalities in Rhino WIP (Sub-D, Cycles, QuadMesh, Voxels) and Rhino's royalty-free developer tools, Frameworks and Ecosystem (RhinoCommon, Rhino Inside, Rhino Compute, RhinoVR, YAK, Grasshopper, food4Rhino). Early Bird tickets until April 15. Register now! * Want to be a speaker or an exhibitor? Contact carlos@mcneel.com.